Article first published as Gluten Free White Sandwich Bread on Blogcritics. Someday I'll delve into making my own gluten free flour blend from scratch but until then I want to use a prepared blend to make it easier for myself. I searched high and low for a good gluten free flour blend that I could buy and use cup for cup in everyday recipes. I came across the Gluten Free Store just outside of Chicago, which is supposedly the largest GF market in the Midwest. It had a sizeable inventory of items including a popular flour blend, Tom Sawyer brand. The owner mentioned that this brand was used very often by both home consumers and commercial restaurants who offer gluten free breads. A fellow customer chimed in and raved how she loves it for everyday baking. This brand already had xanthan gum incorporated in it with the proper ratios so it saves me another step and ingredient to add when using. Another thing is that this blend doesn't contain any bean flour, which is common with some gluten free flour blends. Tom Sawyer brand is simply a blend of rice and tapioca flours, xanthan gum, and kosher approved unflavored gelatin. We all got to talking recipes and I was sold. I tried out the sandwich bread recipe from the Tom Sawyer site and really liked the results! This bread had a nice crust and depending on your preferences, you could bake it with either a hard or soft crust. Directions for both are included below. 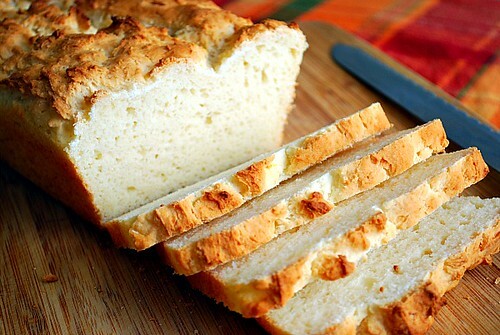 Now when eating gluten free bread, you almost have to expect that the texture will be much more dense and heavy. Gluten has the ability to make things light and fluffy so without it, that same texture is hard to replicate. As a result, when enjoying this bread, I found that cutting the slices much thinner made for a better, lighter sandwich that didn't feel so heavy. I can't wait to bake more of this bread to use in other ways. This recipe has given me the simple pleasure of sandwich bread back! In the bowl of a stand mixer, whisk together the gluten free flour blend, non-fat dry milk, salt, and baking powder. In a 4 cup measuring cup, combine the sugar and warm water. Add the yeast and set aside for 5 minutes. It should develop a nice foam. When it does, add the eggs, vegetable oil, another cup of warm water and apple cider vinegar. Whisk to combine. Slowly pour this wet mixture into the dry ingredients while blending well. With the paddle attachment, slowly beat to develop a slight sheen to the dough. The dough needs to be very soft and sticky and may require more flour or liquid to be added to achieve the proper soft dough. Add one tablespoon of flour or liquid at a time until the dough reaches a point that a peak pulled up from the dough will just drop over at the very top. If the dough is too soft, the rise will collapse during baking and if not soft enough, the rise will be poor. Place dough into a well greased and floured (gluten free flour) loaf pan approximately 9”x 5”x 4” or any other pan of your choice that will hold the dough. Set aside covered with a tea towel, in a warm place to rise until double in size. After proper rise, bake in the preheated oven for about 50 minutes or until fully baked. Inside loaf temperature will be 190 degrees F when done. The 425 degree temperature will produce a hard crust. If you prefer a softer crust, bake at a lower temperature of 375 degrees for 75 minutes or until the interior reaches 190 degrees F.
Thanks for the recipe. I've been trying Gluten Free Breads for years. Then one I recommend trying is a box mix by Gluten Free Pantry called "My Favorite Sandwich Bread" It's a good white bread! Great post! this looks delicious and healthy.These great tasting best gluten free bread have a long shelf life, and should not be stored in a freezer.